Another great condiment. Otherwise known as green, or tomatillo salsa, salsa verde is primarily used as a condiment for many of our favorite Mexican or Latin American dishes. But its applications go far beyond its traditional function as a condiment. For example, add a little salsa verde to a saute pan, loosen it with some chicken stock and use as a base for shredded chicken and tortilla chips. Use salsa verde as a finisher for sauteed chorizo and peppers, or grilled skirt streak with sweet potato fries. Its versatility comes from its incredible natural flavor and ability to stand alone or work into sauces. Tomatillos may look like small green tomatoes, but they reside in the nightshade family, and are more closely related to the gooseberry than anything else (the nightshade family includes several species of plants ranging from flowers to tobacco, most of which are bitter or poisonous to eat – the tomatillo lies on the bitter but palatable end). Raw, they’re bitter, hard to digest and sour to the point of inedible. Tomatillos always need to be cooked before consumption, which leads us, as cooks, to the discussion of flavor profiling and building. Why boil when you can grill? Salsa verde’s flavor, in my opinion, relies half on production technique and half on natural flavor. I recommend grilling and slightly charring as many ingredients as possible, to impart that wonderful smokey grilled flavor into your salsa. It’s easy and fast to make, stores well, and is a great addition to many meals outside the realm of Mexican cuisine. Try it the next time you grill chicken or steak! Have a grill prepared at high heat. Toss the tomatillos, peppers and onion with the oil and a little salt. Place them on the grill along with the sausage. Let everything char evenly. Let the peppers char completely on all sides. Remove from the grill and let cool slightly. Remove the stems, seeds and most of the skin from the peppers (a little skin is okay). 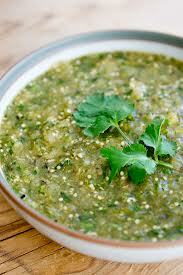 Place the tomatillos, peppers, onion, cilantro, lime juice and a decent pinch of salt in a bar blender. Blend until smooth. Slice the sausage into 1/2 inch pieces. Platter everything with sour cream on the side for garnish. Best served with guacamole, black bean puree, cheese sauce and chili.